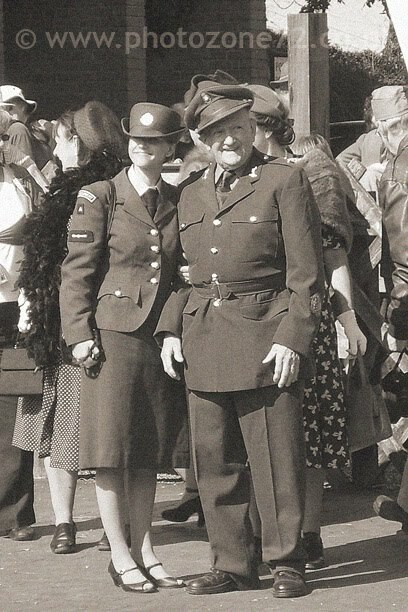 Last weekend we went to the North Norfolk Railway 1940's weekend. We were up in Sheringham last year when it was on, and decided to go back this time around and check out properly what was going on. The first thing to mention is that an awful lot of people dress up and get seriously into their roles at these events, and the second is that the whole thing spills over onto the streets of Sheringham as well as within the environment of the railway. This year even the shops in Sheringham high street got into the spirit of the event with shop staff dressed up, appropriate window displays and even "wartime menus" at a couple of the canteens. Flypasts from a hurricane and a lancaster added to the atmosphere, but above all what really "made it" was the care and attention lavished on the event by the re-enactors, both in terms of their outfits, and the way they really made you feel you were "in their world"
The shot above was taken at Weybourne Station - proud Father about to put his newly joined-up daughter on the train maybe? Who knows, but what is definate is the immaculate way both are turned out. The other people in the background also being dressed appropriately helps, one ongoing problem was the encroachment of the 21st century into shots via carrier bags, digital cameras, and even iPod earphones! ....of the summer, and with it the airshow season. 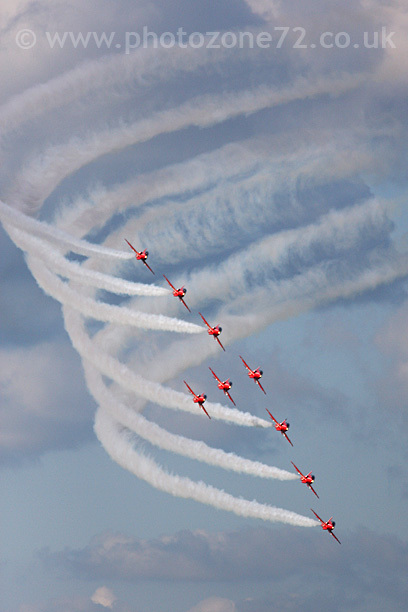 I've not seen so much of the Reds this season as I would have liked - just the three displays at Eastbourne, Dartmouth & Duxford - but as ever they were outstanding on all three occasions. Of the three displays Dartmouth was by far the most special - it always is, not least because I have now got into the habit of climbing up the big hill behind the town and shooting from there - it gives a totally different viewpoint on the display as a whole - at times you're looking down on the action, and at others the trademark red Hawks seem to be coming right at you! I went into the display season this year wanting to do more shots where the Reds' smoke trails were as much a feature of the shots as the planes themselves - having been caught a couple of times now with extremely bland skies, or the sort of conditions that make capturing the "Red" in the "Red Arrows" close to impossible, I felt that this would be a good trick to master as it would potentially enable me to come away with even those sort of displays with shots to be pleased with. What do you think - has it worked?